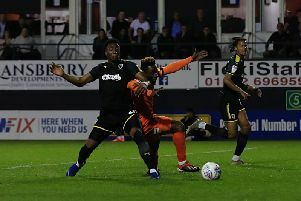 Luton put up a brave display as they were knocked out of the Carabao Cup by Championship side West Bromwich Albion at the Hawthorns last night. Here’s how the Hatters rated during the evening. James Shea: 8 - Keeper made an excellent save from Robson-Kanu in the first half as the Welsh international cleverly fashioned a shooting chance. Could do little about the winner, while his handling and distribution was impressive. Jack Stacey: 8 - Could well have been lining up against the Hatters had the transfer to the West Brom gone through during the transfer window. Showed just why Luton wanted to keep him though with yet another excellent performance. James Justin: 8.5 - Slotted in at left back and being genuinely two-footed was just as composed as he would have on the right. Moved forward well and his clever pass led to Town’s best chance of the game. Real dilemma for Jones over his choice of full backs now. Matty Pearson: 8.5 (STAR MAN): - Defender excelled as he was more often than not in the right place to clear up the danger when Albion attacked. Position was spot on, made some vital headers from set-plays and a threat at the other end too, off target from Shinnie’s deep corner. Unlucky to see his clearance rebound into the path of Burke for the decider. Sonny Bradley: 8.5 - Demonstrated the wealth of talent Town have at centre half this season on what was his first start for Luton. Won his headers, good on the ball and made an increasing number of brave blocks when the Baggies got their shots off. Glen Rea: 8.5 - Is there a player who has improved more in possession during Jones’ reign than Rea? Calm and assured when receiving the ball in tight spots, barely gave it away and helped out defensively when it was needed as well. Captain for the night too. Pelly-Ruddock Mpanzu: 8.5 - Brilliant first half display as he clearly relished the big stage, shrugging off his markers with ease and dominating the middle of the pitch. Less of an influence after the break, with West Brom regaining the initiative, but still disciplined enough to put a massive shift in. Luke Gambin: 7.5 - First run-out in a while and was as neat and tidy as is expected. Final ball was just slightly lacking at times, but game time will have served him well. Thought he had given Town the perfect start only to see an offside flag raised. Andrew Shinnie: 7.5 - Another who the surroundings clearly suited, especially in the first half when he advanced effortlessly from the point of the diamond. Tracked back when needed and sent over some good deadball deliveries, as Luton just couldn’t find a way through. Harry Cornick: 6.5 - Never stopped running all evening, ensuring the home defence had to keep their wits about them. One shot was dragged off target as he couldn’t quite escape his opponents’ attentions. Jake Jervis: 6.5 - Big chance for the striker to impress with Collins and Hylton absent, and had a glorious opportunity to open the scoring, only to drag wide on his left foot. Had that gone in, could well have been a different night. Lloyd Jones (SUB): 7 - First appearance of the season and slotted in comfortably at the back. Elliot Lee (SUB): 6.5 - Came on try and manufacture a way back into the game but found himself snuffed out. Luke Berry (SUB): 7 - By far the best moment of the night when he came on. Outstanding recovery to be fit enough not only to take his place on the bench, but actually get on as well.